I’ve written some about my early days of gaming, days dominated first by the Atari 2600 and then the Apple II. I have also written extensively about the era from EverQuest forward, when I was playing on a Windows machine of one sort or another. But there is a whole middle-era that I have mostly left out, or only alluded to in passing, that involves me working and playing games on the Apple Macintosh platform. And it was quite a big part of my evolution as a gamer. Flashes of that have come through when I wrote about Air Warrior or when I mention things like Marathon or Bolo. But it isn’t a topic I’ve delved into much, for reasons I will get to. But first, some history. I was still invested in the Apple II though, which had more software, did more things, and was all I needed at the time. I played Wizardry and Ultima III and Bard’s Tale and Karatka and was happy. Meanwhile, the original Macintosh was neat and all, but other that drawing pictures in MacPaint, there wasn’t much to it. Time moved on, and new Mac models came out. I used my student discount to buy my friend Kip a Mac 512Ke, but stuck with my Apple II. Then two things happened. First, somebody swiped a box of mine while I was moving out of the dorm at the end of the semester. That box contained mostly Apple II disks, which cut the legs out from under my investment in the hardware. I didn’t lose everything, but a lot of software was gone and I wasn’t going to go buy it all again. I wasn’t even sure I could buy all of it again. Second, as part of a group project we did a bunch of work at one person’s office. They did all their stuff on the Mac and so I did a bunch of the writing for the project on a Mac SE with an Apple Extended Keyboard on Microsoft Word. The Mac SE was the first model to lose the already dowdy looks of the original Mac, a look that was still present in the Mac Plus. The new Apple Desktop Bus keyboard and mouse that came with it were a lot better than the original Mac versions. And Microsoft Word was really good on the Mac. I really like the WYSIWYG aspect of it. It was light and ran well. Add in the ability to print your documents out on one of those new laser printers and I was sold. In early 1987 I bought a Mac SE through a contact that was able to buy at the Apple developer support prices, which probably saved me $1,500. Computers were expensive back then. But I still needed a hard drive. You couldn’t get by without that even back then, the sizes of which seem comically small by today’s standards. A 20MB drive was a pretty common option, but I went out and spent all that money I saved on the Mac SE on a 70MB drive from Jasmine Technologies, a company I would later end up working for. Anyway, I was committed. My Mac era had begun, and would continue on for almost exactly a decade. I ended up working at companies that did Mac products, even working directly with Apple on a few things. I ran a Mac oriented BBS from 1990 to 1995, which gave me a knowledge of modems at the dawn of the dial up internet which also got me a few jobs. But Apple was a ship without a rudder in the 90s, wandering thither and yon, unfocused and living on its past reputation. By 1997 the place looked doomed. Michael Dell was telling people that the company should shut down and give the stockholders the proceeds. The startup I was working at folded up shop and I had to take what little Windows knowledge I had gained to try and find a job elsewhere. Having Macintosh on your resume at the time was only slightly better than having McDonald’s listed. A lot of people I knew made the transition. A year later I had a job in enterprise software, secured largely on my rather superficial knowledge of ISDN (I was hired to work on that, then never did, moving immediately into speech technologies), and a Windows NT Desktop machine in front of me. Since it had always been my habit to have a machine similar to my work machine at home, I swapped over to Windows there was well. I soon had a Dell Pentium II machine set to dual boot into either Win95 or WinNT. It wasn’t my first Windows box. I had a 66MHz 486 a few years back just to tinker with Win95, but it was the first Windows box set to be my main machine. Somewhere along the line I got a 3Dfx Voodoo I card… I forget now why I bought it… some game needed it I am sure… so when EverQuest came out I was ready to go. And almost all of that Mac stuff went away. I kept that Apple Extended Keyboard for a long time. It just sat on a shelf, gathering dust, but it was such a good keyboard that I hated to just toss it. I got rid of the PowerMac 8500, the last desktop Mac I owned, and the Windows compatibility cared I had borrowed from a friend at Apple so I could run ZMud when playing TorilMUD. After using it on that other Windows machine, I had to find a way to keep using it. Other bits and pieces disappeared over time. The TI MicroLaser Plus laser printer stayed a bit, but it was a decade old and supplies were getting scarce. Boxes, diskettes, CDs, and manuals of various historical value got tossed as time went on as my wife and I moved, then moved again. Now, more than a decade on from our last move there are very few things around the house to suggest I ever had anything other than a Windows box during my career. There are some Mac World Expo badges hanging off a peg, a couple of really old CD jewel cases with titles like Spaceship Warlock or Pathways into Darkness (early Bungie title! ), or my affection for the big ball Kensington Trackball that might give it away, but not much else. I am in a constant battle between keeping old stuff and not having my office turn into a trash heap of old crap. So I do my own Marie Kondo thing and sift through stuff and ask myself if it brings me joy or not, which gets me to throw things out now and again. And I have forgotten much. I am able to go write about TorilMUD as often as I do not because I played it so much during the 90s, but because it is still there and I can get ZMud to still launch, so I can revisit and refresh old memories. Then, a couple of weeks ago, I was once again going through my office and throwing things away (like a Jambalaya MRE a friend brought back from the Gulf War) and in a drawer in a dresser that is stuffed in the closet in my office I found my old Macintosh PowerBook 190cs along with the power supply… and the receipt. I paid $1,499 for it at ComputerWare back in early 1996. I remember having this laptop… the only laptop I have ever purchased for myself, since work has always seen fit to issue me one if they think I need one… but I didn’t know I still had it until I dug it up. It was a curious model, straddling the 500 series and 5300 series of Apple PowerBooks. It had the then new simpler design aesthetic (the 500 series looked like Batman’s laptop) but was powered by the 68040 processor rather than the PowerPC processors then entering the Macintosh model line. It was the last 68K series laptop Apple produced, and the last 68K Mac I ever owned, putting it at the end of a long line that included the SE, Plus (to run my BBS at one point), SE/30, IIci, IIsi, Quadra 700, and Quadra 800. I pulled this antique out of the drawer and set it up on my desk, uncertain if it even still worked more than 20 years after I purchased it. I had to figure out how to turn it on. It was part of the ADB era, when Apple put a power button on the keyboard with a symbol I had long since forgotten. But when I figured it out, the speaker chimed and the unit spun up into life. 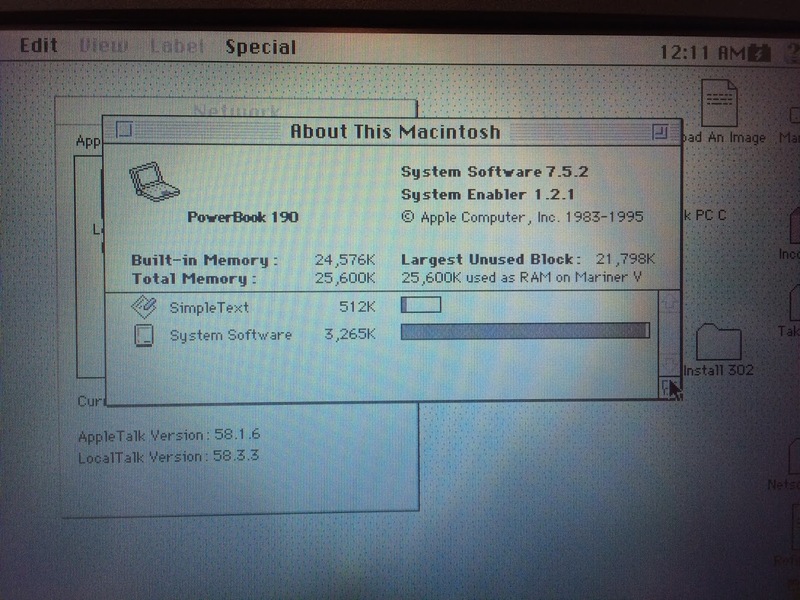 MacOS 7.5.2 – And Look at all that RAM! The motherboard battery had faded years ago, so the time and date came up as midnight on January 1, 1904, the default day zero of the MacOS at that time. I was a little concerned as to whether or not it would recognize 21st century dates, but it seemed to handle that. Digging through the drive, I found some old apps. There was a copy of Eudora, my favorite email app of old, probably full of notes to my girlfriend at the time, now my wife. I used to write her emails while builds ran. Now I just text her. There was a copy of Claris Emailer, which I used to monitor the support account. At a startup you have to do all the things. There were all sorts of little utilities. A copy of Microsoft Word 5.1a, the last good version of Word. At that point it had achieved a fullness of features yet still fit on a 1.4MB floppy. And in a folder titled “Games ƒ” I found… some games. Old games. Games from 20 years back. Not a lot of games. This was my work laptop after all. But a few goodies in there that I didn’t think I still had around. So I have something from that era to write about, old games played on era authentic hardware. But first I want to get the PowerBook on the network so I can get some screen shots moved over. The 190cs didn’t come with built-in Ethernet, but I had a Global Village PC Card that had both modem and Ethernet support. However, that needed an external dongle (referred to as Clyde by the team that worked on it for reasons I do not recall) and I could not find the dongle. 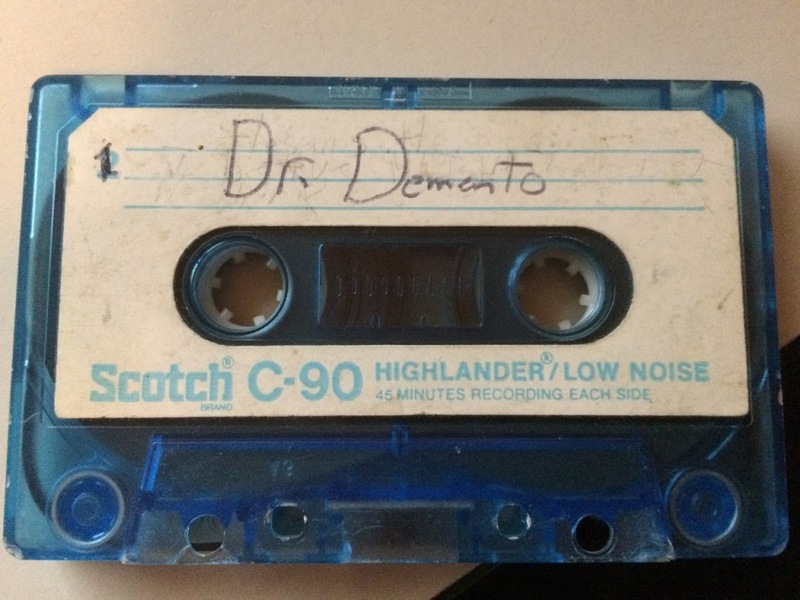 But a packrat friend and former co-worker of mine had one and sent it to me. Now I just need to get it configured. As it turns out, MacTCP from 1995 was pretty primitive. There is, for example, no support for DHCP. So far I’ve gotten to the point where the router sees the 190cs and has allocated it the IP address it asked for, but it cannot ping anything and cannot resolve any domain names. Launching Netscape Navigator 4.04, the only browser installed on the unit, yields no web yet. At least I have a bunch of network utilities in another folder. 20+ year old network utilities, but maybe they will tell me something. We shall see. Maybe I’ll get to that later. I do still own a car with a cassette deck. This entry was posted in entertainment, Hardware, Other PC Games and tagged Apple, Apple PowerBook, Dr. Demento, Macintosh, The 80s, The 90s on March 1, 2019 by Wilhelm Arcturus.